PHOENIX – (October 1, 2015) – Arizona Cardinals cornerback Patrick Peterson announced his Celebs and Steaks ticket sales after revealing his third “Patrick’s Corner” to the students of Frank Elementary on Monday afternoon. After revealing his third “Patrick’s Corner” at a press conference and ribbon-cutting ceremony, Peterson visited with the students. 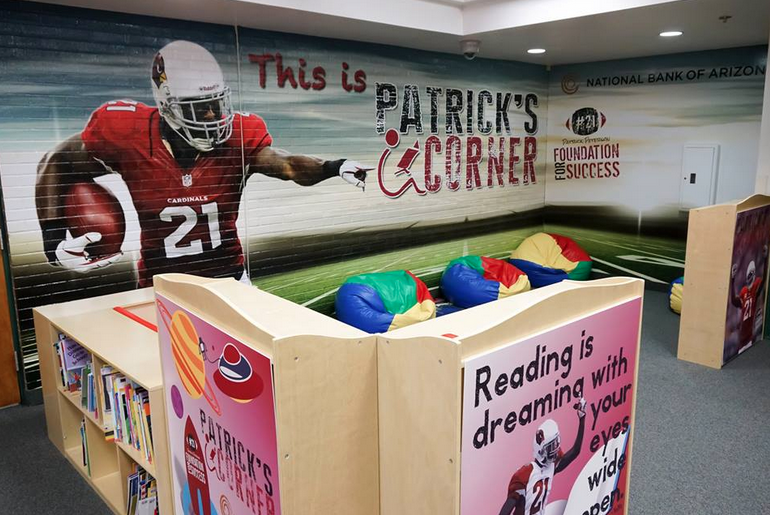 Sponsored by National Bank of Arizona, “Patrick’s Corner” will provide access to books and a fun environment to read with friends and family for at-risk students. “Patrick’s Corner” is made possible by local fundraising events such as Celebs and Steaks, which Peterson will host at Donovan’s Steak and Chop House on the evening of Monday, November 16 to benefit his Foundation for Success, whose mission is to provide low-income and inner city youth with opportunities and resources to reach their full potential. Peterson and his Cardinals teammates will step off the field and into the kitchen for one evening only to help serve the world-class cuisine of Donovan’s Steak and Chop House to more than 200 guests. In addition to celebrity service, guests will enjoy a cocktail reception sponsored by Hensley Beverage Company and have an opportunity to participate in exciting live and silent auctions. Sponsorships and tickets can be purchased online at patrickpeterson.org. Single standard tickets are available for $250 per guest, while single premium tickets are $350 per guest and include an Arizona Cardinals Signature Series Football for celebrity autographs. All tickets include wine, hors d’oeuvres and a three-course meal as well as tax, gratuity and valet service. Outside memorabilia is prohibited. iHeartMedia is the exclusive media partner for this philanthropic event. For more information about the Patrick Peterson Foundation for Success and Celebs and Steaks, or to purchase sponsorship packages and tickets, please visit patrickpeterson.org.